Dolmen key success factor is directly dependent on its ability to facilitate the supply chain of services through its subsidiaries and its international network. Through its track record, Dolmen was able to establish complementary subsidiaries that provide a state of art network to ensure smooth transition of projects as it progresses. Moving from different phases within the same organization secures a higher level work and covers the gap in the different sectors in the market. 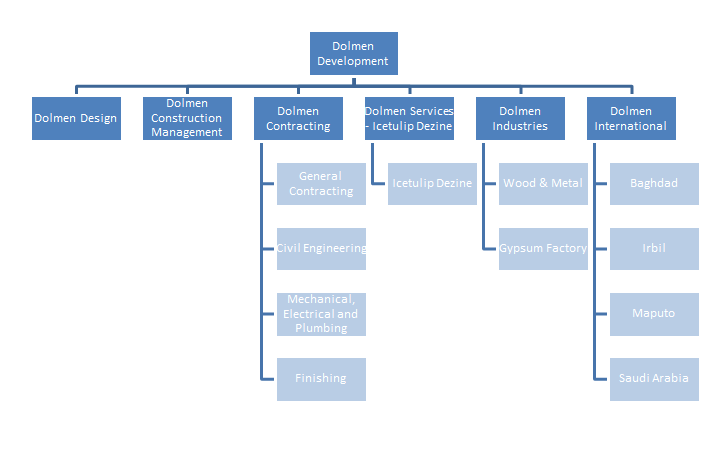 Since its inception, Dolmen was always targeted to create better bonds between its subsidiaries and in the same time creating the independency needed in order to serve the clients with specified demands. Below is the corporate structure of the Group.